Miami Beach commissioners are voting today on a resolution that would see the use of “Miami Beach Red” sidewalks continue and expanded (the red actually appears mostly pinkish). Controversy over coloring of the sidewalks was first ignited in 2009, when architect Frank Gehry asked for the sidewalks around the New World Symphony to be built with natural concrete color, rather than red. Some wanted pink sidewalks to be replaced throughout the city, saying that over time they become mismatched and ugly due to fading and other factors. Even when the sidewalks are new they often don’t match, depending on how the red powder is mixed into the concrete. If commissioners approve the resolution today, any remaining gray sidewalks will be replaced with pink over time. Many sidewalks in the City of Miami Beach incorporate a “Miami Beach Red” color standard (a distinctive reddish/pink color), while others are a natural gray concrete color. In LTC No. 261-2009, the Administration summarized the available historical facts concerning the origin of “Miami Beach Red” sidewalks, including a conflicting record of Carl G. Fisher’s intent of using red sidewalks throughout the City, given Carl Fisher’s development of certain neighborhoods, such as the Palm View Historic District, with exclusively natural gray concrete sidewalks. At the October 5, 2009 Capital Improvement Projects Oversight Committee meeting (CIPOC), the CIPOC discussed whether the City should continue to install “Miami Beach Red” sidewalks or use the more economical natural concrete color, in response to the request by Frank Gehry, the architect for the New World Symphony campus, to install natural concrete sidewalks on 17th Street. The Administration recommendation at the time was for the City to use the natural gray concrete color standard for sidewalks in non-historic districts, and for the Historic Preservation Board to make the determination as to sidewalk color in historic districts. The color of the older “Miami Beach Red” concrete sidewalks have raised various maintenance issues with the passage of time, as the red oxide is partially or totally worn off from foot traffic and weather, exposing the sidewalks to patches of gray concrete adjacent to highly concentrated patches of red oxide powder, resulting in aesthetically unattractive irregularities. Since the 1990’s, the City has exercised diligent efforts to correct and manage the patchwork and maintenance issues by thoroughly integrating the red pigment into the concrete mix for the full depth of the sidewalks in all new construction projects, utilizing a controlled color mixing formula to the cement batching plants. Notwithstanding the City’s color integrity efforts, sidewalk color can still vary significantly from concrete batch mix to batch mix, when new sidewalks are poured by utility companies while conducting ongoing repairs and upgrades to their systems. In addition, frequent pressure washing removes the top layer of the color cement exposing the aggregate which cannot be colored. 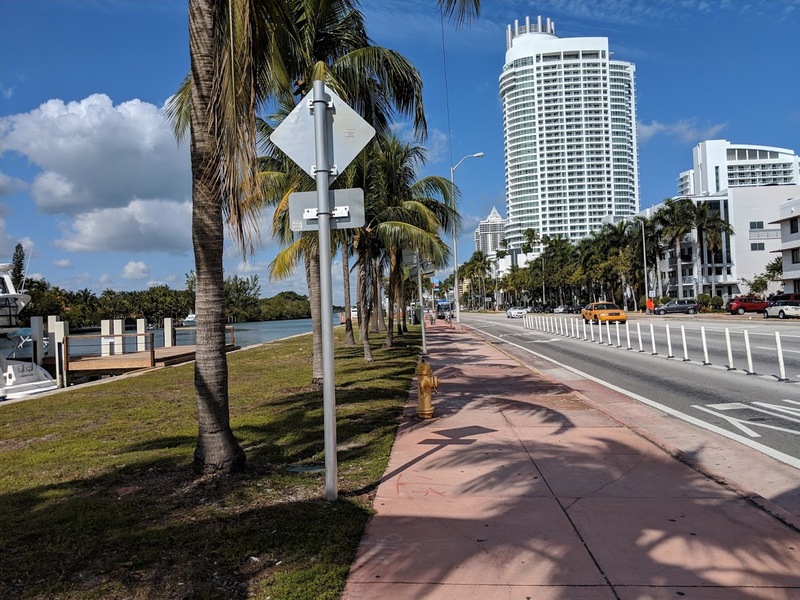 At its January 29, 2019 Goals Conference, the City Commission expressed their preference for the “Miami Beach Red” sidewalk theme to be continued throughout the City, and as such, directed the Administration to replace gray sidewalks with the “Miami Beach Red” color standard. The Administration has recommended that the gray sidewalks be replaced gradually over time as new neighborhood projects are implemented, when an entire block is to be replaced, so as to ensure a cohesive sidewalk color pattern is maintained within each street. The Administration further recommends that the City Commission delegate to the Public Works Director the authority to determine if replacement of gray sidewalks with the “Miami Beach Red” color standard is otherwise appropriate, such as in instances where significant portions of the “flags” of concrete within the same block are being replaced. The Administration maintains the reservations stated above regarding the wholesale conversion to red sidewalks however we can work within the parameters of the Resolution as presented. I think it should be continued. Agree.. it’s a Miami Beach brand. I think pink would work in Miami Beach. But that picture of the sidewalk in this article looks terrible. Bland and faded looking. Gag. Not sure if this is true, but I read long time ago that red pavement “absorbs” the sun light rather than reflect it like white pavement specially in warm weather areas. That’s why lots of areas at WDW the pavement is red. Again, not sure if this is true. A two year study should be conducted to determine which color would be better, red or natural, then scrap the study and install pavers!! After another two year study ofcourse! Like Metrorail or streetcar/light rail Baylink. No BRT, Metromover, or theme park ride B.S. please! Hell no! The first thing one notices upon arrival to Miami Beach is the ugly discolored sidewalks. Who ever came up with the idea of PINK sidewalks? Looks silly! They could be real trademark if maintained by storefront owners…old fashion pride.